Creative Building & Remodeling is a full-service kitchen and bathroom remodeling company serving homeowners in Troy, surrounding cities, and throughout Southeast Michigan. As your leader in the home remodeling industry for 35 years, our job is to create meticulously designed, elegant kitchens and baths with your satisfaction guaranteed at every stage of the project. It is our goal to make your home renovation process smooth and hassle-free, which is why we only employ experienced contractors who specialize in kitchen and bath remodeling. Creative Building & Remodeling offers you the latest techniques and products from our industry; all the while keeping pace with the changing technology and new innovations. We will coordinate every aspect of your remodel, from design to completion with outstanding customer service, quality materials and quality workmanship. We even stand by our work with an unheard of 10 Year Warranty. From cabinets and countertops to flooring and tile installation, we can handle all your kitchen and bathroom renovation needs! Bathroom Remodeling Remodels & Renovation Services in Troy, MI - Get ideas and inspiration for your next project! Remodeling your bath to look like everything you've ever imagined might be difficult to do on your own. Trust the professionals at Creative Building & Remodeling to eliminate the hassle of planning and designing a new bath. 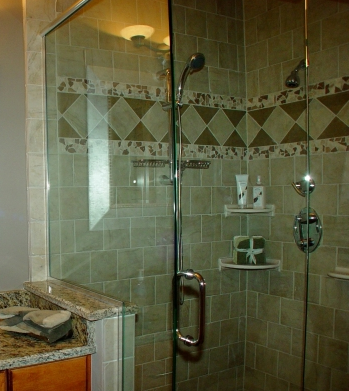 We provide top quality, stress-free bath remodeling service at a price you can afford. It doesn't matter if you just want to convert your tub to a shower, or want a complete renovation. We are the company for you. We can turn your ordinary bathroom into an oasis! Whether you want a whirlpool tub to soak in or a shower with more elbow room, we will use top of the line materials and experienced installers to provide that for you. We offer a vast array of durable products, including Glassguard® shower doors that utilize state-of-the-art technology to create a permanent, protective bonding agent that becomes part of the glass surface itself. The glass can be easily cleaned by rinsing water on the surface and wiping with a microfiber cloth. Our shower doors are supplied by Custom Euro and Glass Source. Enjoy these durable and resilient products without having to sacrifice luxury. We make sure to get the job done right the first time. Contact us today for a free estimate! The kitchen is a comfortable place where you and your family spend a great deal of time together. Remodeling an outdated kitchen can bring a dull, inefficient space back to life. 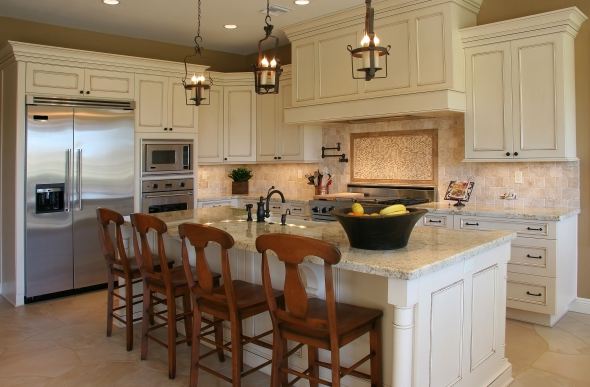 Our experienced team of contractors can revitalize your old kitchen into the one you've always dreamed of. If you desire a complete kitchen renovation, we will create a layout for you and help you with material selection that meets your budget. Visit our showroom to view the different types of cabinets, counters, flooring, and tile that we provide. "All materials used were top notch quality. Very satisfied and would recommend this company to others." Joe A. "I love my new kitchen! Everyone that sees it just loves it. Thank you for an excellent job!" Catherine M.
When it comes to kitchen and bathroom remodeling, our experts have the knowledge and tools needed to make your dreams a reality. Contact us today for a consultation and we can provide you the look you want with the performance you need!